But what about the other portion of the blog? The essay, the headnote, the this. When I read advice from successful bloggers, the same opinion is often echoed: “find your personal voice”, or “be yourself”. But how does one consciously follow this advice? If the hallmark of a successful blog is the convergence of skilled writing and a defined, likable personality, what qualifies the personality? From the writer’s perspective, where is the demarcating line, the happy medium, between inviting a reader into your life, and giving away the store? I haven’t figured this part out yet. Sometimes my writing feels too disjointed, too scattershot, to be building toward anything. Do I hold back too much? To establish a readership in an internet already over-saturated with food blogs, are your skills as a confessor, as a memoirist, almost more important than your abilities in the kitchen? It’s worth mentioning that I write this blog for me, mostly. (One of the most valuable lessons I learned in graduate school was that any sort of creative writing is generally a thankless, glory-less enterprise. Writing is a solitary activity and publication is elusive. Motivation must come from within, and cannot be dependent on the approval (or disapproval) of others, or you won’t last five minutes.) It would be a lie, though, to claim that I don’t hope people are interested in what I post. Great ingredients, and cooking, and sharing food with others is what gets me out of bed in the morning, and I’m driven by the idea of transferring that enthusiasm and my ideas to others. If this admission is nerdy or over-eager, so be it. It is also the truth. What do I look for in a blog? Simple, attractive design. Lush photographs. Solid, inspiring recipes, and by extension, good taste. But in the end, isn’t the writing the most important consideration? Sincere, engaging, articulate, and yes, personal, writing; isn’t it the magic bullet? Isn’t that what compels us to return to some blogs over and over? You recognize a charming personality when you see it. Alas, if only winsome self-portraiture were as easy to accomplish as it is to suggest. At the moment, I am maddeningly, frustratingly sick. I’ve been tired and fuzzy-brained for the better part of a week, and it is seriously cramping my style in the kitchen. There are so many recipes I want to fiddle with, but I just can’t make it happen right now. First I wanted to make an “I’m really sick” soup, a ramen rip-off with white miso, ginger, garlic, hot sauce, and a soft boiled egg. But I am too sick to actually pull it off. And then there is herby pot pie, to make good use of the leftover roast chicken in the fridge, but that too will have to wait. Finally, a muffin recipe is circling for a landing, something to do with burnt-sugar bananas, coconut milk, and lime glaze. All in good time, I suppose. 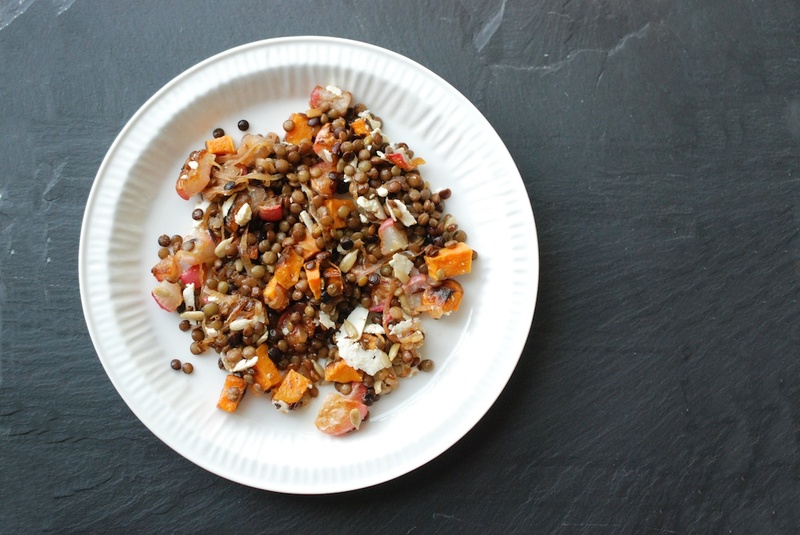 Instead of all that, I present you with a lentil salad, a recipe I developed for a Meyer lemon-themed article for Food52. This is a sturdy recipe, and a good one. 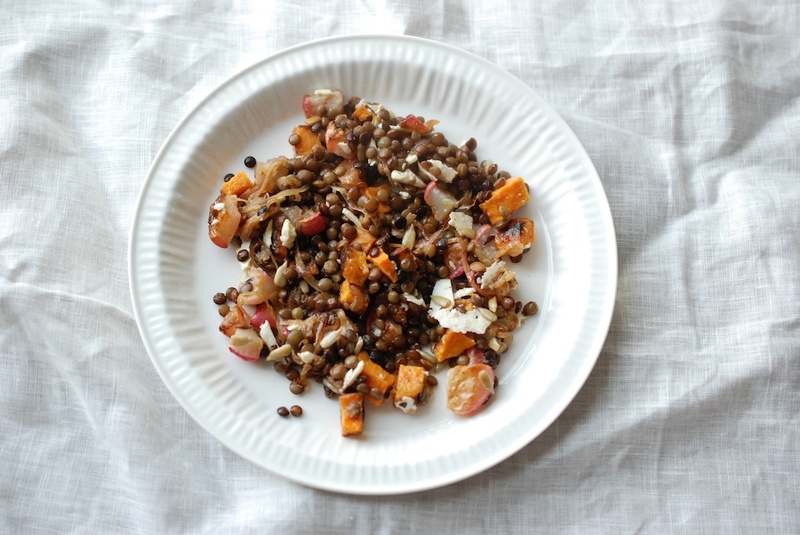 The ingredients are all inexpensive, although the final dish is bright, hearty and healthy, and pretty good looking I think, as far as lentil salads go. 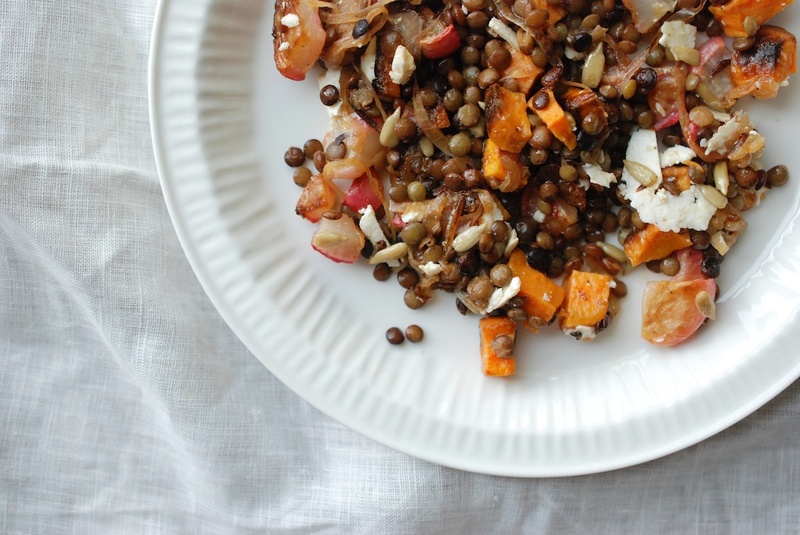 It works as a side dish, but it also makes a filling lunch all on its own. The salad is vegetarian, or vegan, if you hold the cheese. Add some chopped parsley, if that’s your thing. If you happen to live in a part of the world not currently experiencing tundra-like coldness, this salad makes great picnic fare, as it benefits from a few hours relaxation. I’ve also brought it to work with me–it packs great texture and flavor into one compact container. 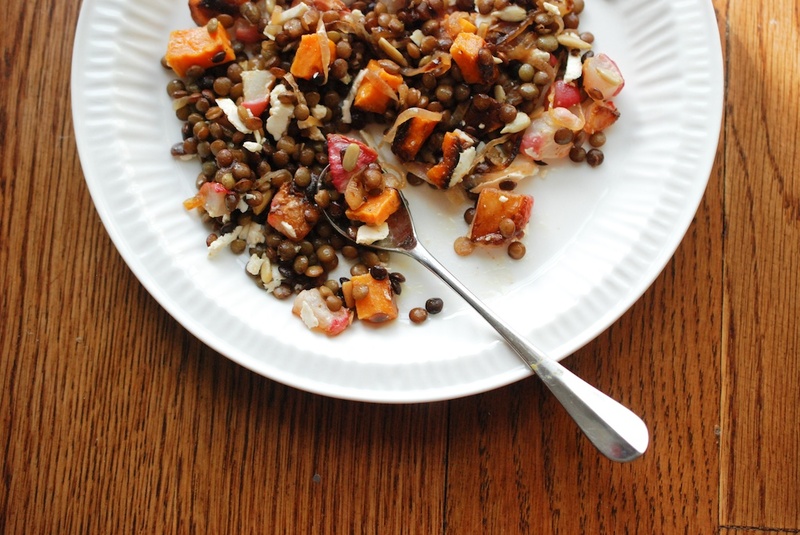 A note on the lentils: I used green lentils from Le Puy, but the recipe is flexible; use whatever lentils you like. A note on the ricotta salata: If you don’t have ricotta salata, or don’t feel like buying some, try another semi-soft and salty cheese, like feta. 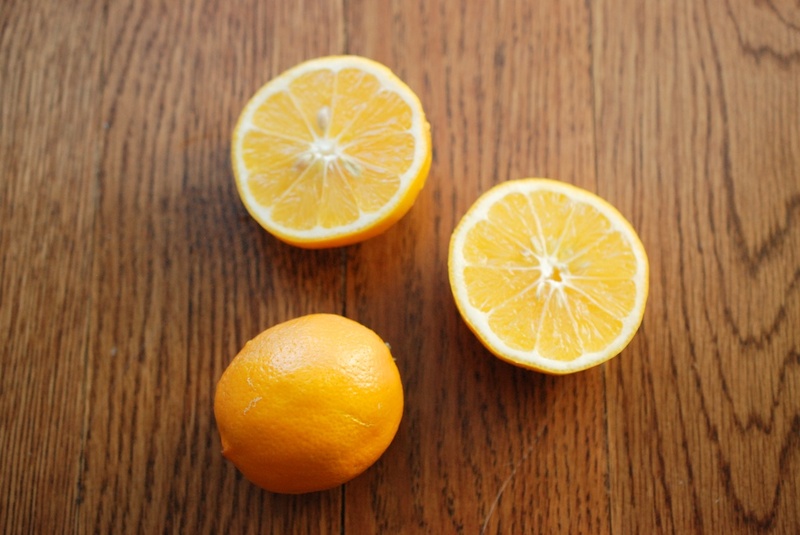 A note on the Meyer lemons: I like the sweet-sour flavor they bring to the table. They aren’t too hard to locate in the supermarket these days, but if you can’t find them, feel free to substitute regular lemons. Blood oranges might also be nice. A note on the vinegar: If you don’t have sherry vinegar, you can use red wine vinegar instead. 2. While you’re waiting it for it to warm, scrub the radishes clean and trim the ends. Peel the sweet potato. Dice both into small, bite-sized pieces. Toss them with a few healthy glugs of olive oil, salt and pepper. 3. Move the cubed radishes and sweet potatoes onto a baking sheet, and then move the baking sheet to the oven. Bake the vegetables for 30-35 minutes, tossing the vegetables every 10 minutes or so as you go, until they are very soft inside and partly blackened on the outside. Set the vegetables aside. 4. Like you would with beans, pick over the lentils, and remove any rocks or bits that shouldn’t be there. 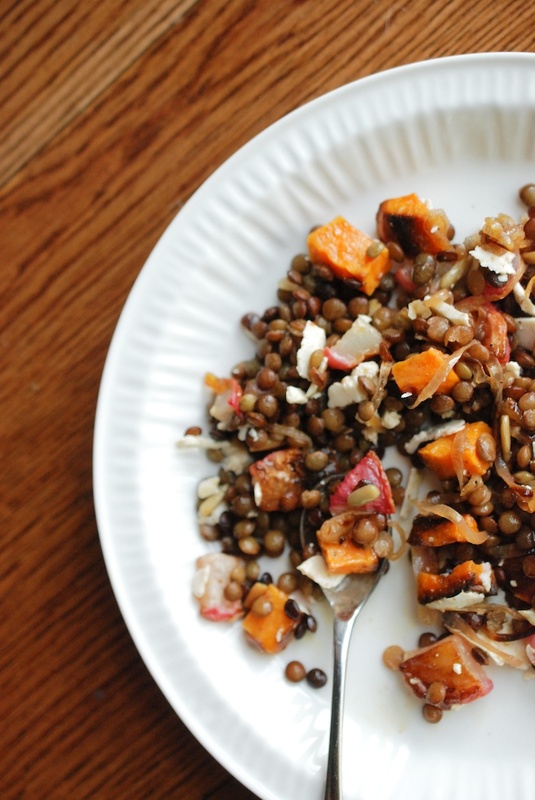 Rinse the lentils, and then move them to a pot with 2.5 cups of water. Smash one of the garlic cloves, and add that to the water, along with the bay leaf. 5. Turn the range to medium high, and let the water come to a boil. Once it does, reduce the heat to a simmer. The lentils will take anywhere from 20 minutes – 1 hour to cook, and you will likely need to add more water to the pot during cooking time. The lentils are done when they are softened and chewable. Strain the lentils, and add salt to taste. 6. Remove the skins from the shallots, and then slice them thinly crosswise, into rings. Meanwhile, heat a few tablespoons of olive oil in a pan over medium heat. When the oil is warm, add the shallots. Stir as you go: you don’t want the oil so hot that the shallots burn too quickly. You want the oil just hotter than if you were sautéing until transparent. This time, cook them past transparency, until they are soft (but browned) in some parts, and crisp in others, about 7-9 minutes. Turn the heat off, and set the shallots aside. 7. Spoon the Dijon into a small bowl. Run the remaining garlic clove through a microplane, and add this to the bowl. (I find this helps soften the harshness of fresh garlic. If you do not have a microplane, you can simply mince the garlic finely, and run some water over it.) Add a pinch of salt and pepper to the bowl, along with the sherry vinegar. Give everything a stir, to combine and to help dissolve the salt. Add the Meyer lemon juice and zest, and stir again. Finally, drizzle in 1/4 cup olive oil, whisking as you go to emulsify. 8. 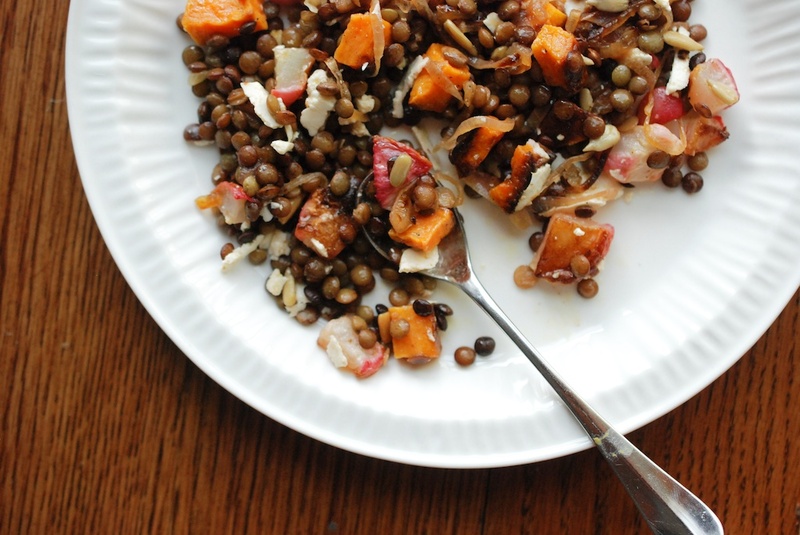 In a large bowl, mix together the radishes, the sweet potatoes, the lentils, and the shallots. Gently fold in the vinaigrette. At this point, I used a vegetable peeler to shave ricotta salata on top; add as much as you like. Add the pepitas. Stir gently to incorporate all the ingredients. You can eat the salad right away, or wait a few hours. It is good warm or cold. 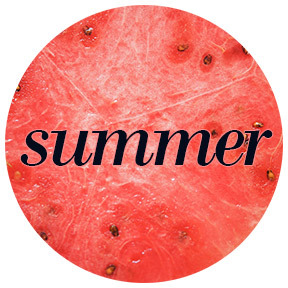 Found your blog via Food 52 and really like it. 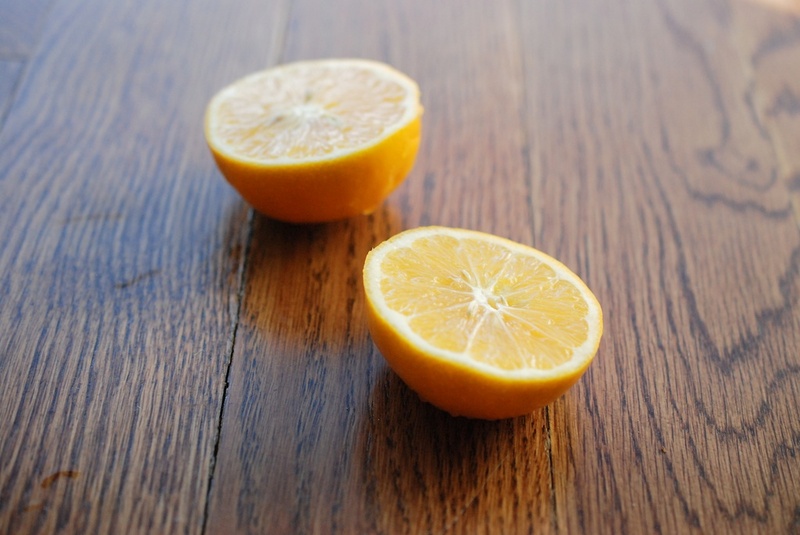 The Meyer lemon recipe just sucked me in having traded a big bag of Fuerte avocados for 2 dozen Meyer lemons (heaven). Your comments about writing a blog struck home especially the statement “I write this blog for me, mostly”. Been posting to my blog for four years. Periodically contemplate “my voice” and inevitably, I keep coming back to that reason, It’s for me, mostly. Look forward to future posts and recipes! Hi Christine, Thanks so much for you comment. I’m relieved to know I’m not the only one who worries about such things! Also, Meyer lemons and avocados! Guacamole, please! Wow – this sounds delicious! I have some Meyers lemons at home and I’m making home-made ricotta salata – but I have a question. Are these just regular red radishes? I’ve never roasted them before…Leave the stem and tail attached and roast like a beet? Hi Linda, Yes! They are regular radishes. I love roasting radishes, as it brings out a sweetness in them. I usually trim the radishes before roasting; sometimes I dice them, sometimes I leave them whole.